Pictures of original Whaler 21-Outrages just keep coming! Here is another old Outrage, still giving good service. ContinuousWave correspondent Brian Blazer was vacationing in the Punta Gorda/Charlotte Harbor area on Florida's West Coast when he came across another outstanding example of Classic Whaler. Brian was kind enough to stop and take these excellent photographs of this very handsome Fire and Rescue boat. While the boat is on the hard at a marina, it looks like it is ready to put to sea when needed and equipped to handle a range of emergencies. Brian, who has had some experience with the legendary rough ride of early Outrage hulls in big seas, says "I think that the back board may be intended for the passengers rather than the rescued!" 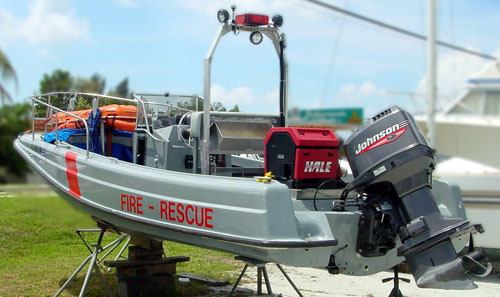 The Punta Gorda/Charlotte Harbor Florida area maintains this classic Whaler as a Fire and Rescue boat. 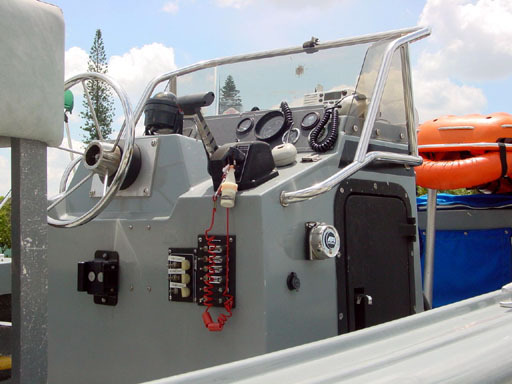 That gray gelcoat goes nicely with the big 175-HP Johnson outboard. 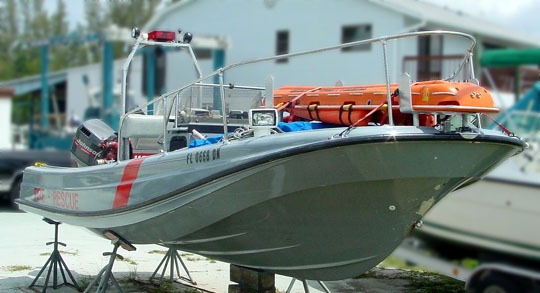 This classic Whaler is well equipped for its duty in Fire and Rescue. A big pump fills the stern cockpit. 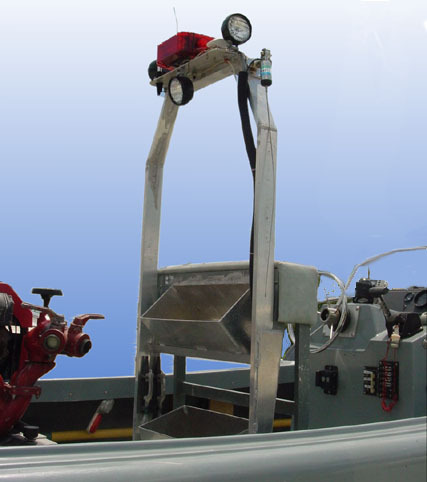 A floating back board rests across the bow. The shallow draft is perfectly suited to the waters of the Gulf Coast, which tend to be a little on the thin side in places. The classic curves of the bow are very prominent in this view. The Whaler "Smirk" or "Brow" was introduced on the Outrage in 1970. This boat appears to be a c.1973 hull since it lacks the exterior ribs of its earlier cousins. The extremely curved shear line and low rub rail are also evident. No wonder they called this model an "Outrage." This "radar arch" doesn't seem to have a radar, but it does carry several antennas and lights. Any guesses what those large bins facing aft on the back of the leaning post might be used for? The page has been accessed 43378 times.